Lighting equipment is expensive and so I spend a reasonable amount of time searching out used equipment on Ebay. Craigslist tends to be too small of a market even in the SF Bay Area to get a good selection of equipment on a regular basis. I got my favorite lens, the Sony 135mm f/1.8 Carl Zeiss, on Ebay for 1/3rd off the nominal price. About the same time I got the lens, I found a Dyna-Lite set that picked up for $217. New Dyna-Lite kits are about $2k, but lighting equipment hasn’t dramatically advanced in a long time, so used sets have great potential. I wasn’t a complete expert on the different makes and models of Dyna-Lites, but it is one of the best brands in the lighting industry and they are made to last forever. Needless to say that this became a journey. After visiting about 20 stores, I finally found out what type the plug was called — a twist-lock and if you have seen the bestiary of plugs, it’s worth examining at NEMA. Of course no one had one of these plugs in-town but I eventually traced one plug to an electrical supply store in Maine which got it to me for $20. Then I found that a couple of bulbs were burnt out and Keeble & Shuchat which replaced then for about $30. Low and behold the lights worked great – immensely bright. Now I needed light diffusers and finding the right speed ring was a trick, but Keeble & Shuchat gladly helped me at locating the right speed ring and getting me a beautiful Westcott soft box for it. This entire process took about a year, as it wasn’t high priority and today I did the first quick shoot of my daughter with the new setup. It was a two light set up with soft boxes. The bright one is the new 2’x3′ soft box that I got on the Dyna-Lite and the dimmer one is the old Westcott moonlight on a 2’x2′ soft box. I liked the results with the new bright light and can’t wait to use them more. The long story short is that Dyna-Lites last forever and you can recover these old beautiful systems. This is the last of the shots that for the outdoor headshot round. It is a similar to the others in that it is a two light setup with the model in the shade and the background being lit by late-day sun. The two lights are a soft box coming in from the left acting as the key light and exposed to f/8.0 and the fill light being a strip box and coming in from the right and exposed to f/5.6. I shot at f/3.5 in this case using a neutral density filter to tamp down the light. You can identify the lighting via the catch lights easily. The lighting worked out pretty well because there wasn’t any breaking on the highlights of the skin, which can easily happen with lighting when you aren’t using powder. If there is one thing that is missing from the shot, it is a good hair light. His hair is nondescript and not dynamic. Unlike with people with long hair, you often need a third light coming down from above to really get good highlights on short hair, particularly dark hair. I used f/3.5 because gave me a reasonably narrow depth of field. I was about 10 feet away from the subject and the background was another 15 feet away. The depth of field was about 4 inches in this case, plenty wide to get his whole face in tack-sharp focus, but narrow enough that the background would dissolve reasonably well. If you aren’t familiar with depth of field calculations, there’s a handy website that will let you work it out at Depth Of Field Master. Zooming in on his shirt and blazer illustrates the fall of focus. 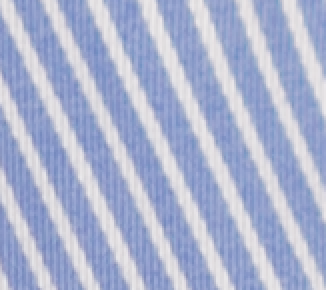 The first crop is near the middle of his shirt and you can see each thread beautifully well, while the second shows the shirt falling under the blazer and the focus is softening appreciably. All-in-all this was a good shoot that came out pretty well, we shot for about an hour doing six rounds of photos. We took about 250 photos between the six rounds and had lots to choose from. Everyone got at least one head shot that they liked. We didn’t have the option to do much scouting for an environment and simply used my backyard. I was still happy with the shots and enjoyed knocking these out. My husband, Jay Wacker, isn’t a very good model, so I often end up having to model for my own shots at Mira Zaslove Photography while I’m experimenting with lighting. 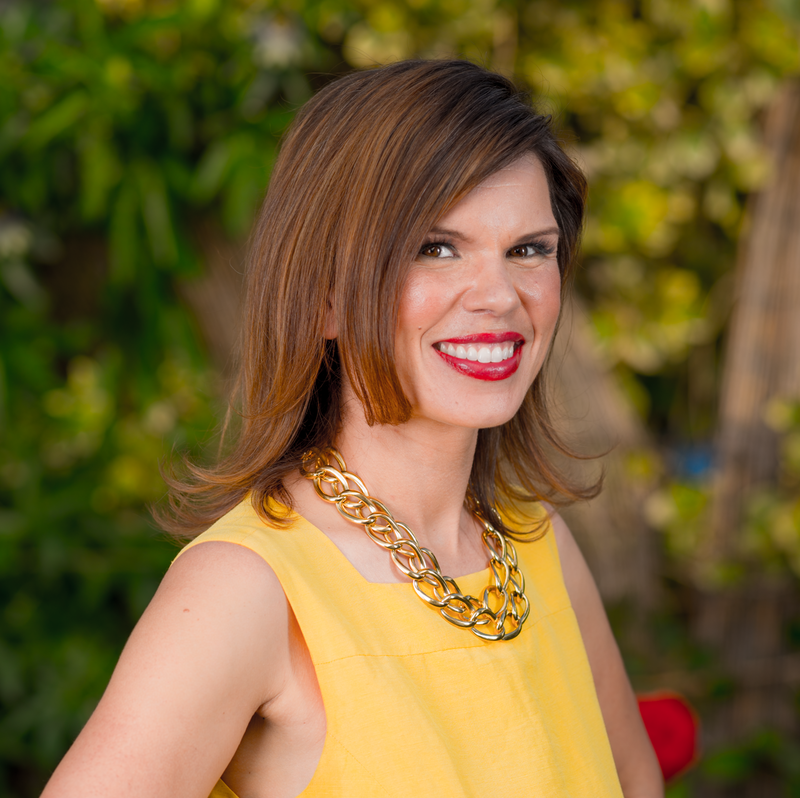 In this case, I needed a new headshot, so I was looking forward to this shoot. This shot was part the series I talked about in the last few posts. Like the last post this was a taken with the Sony Carl Zeiss 135mm f/1.8 lens which is my favorite lens in my collection. I’m looking forward to the update of this lens that is finally coming out. I’ll have to see what the cost differential is to upgrade, though I’m in need of a high quality 50mm lens before then. 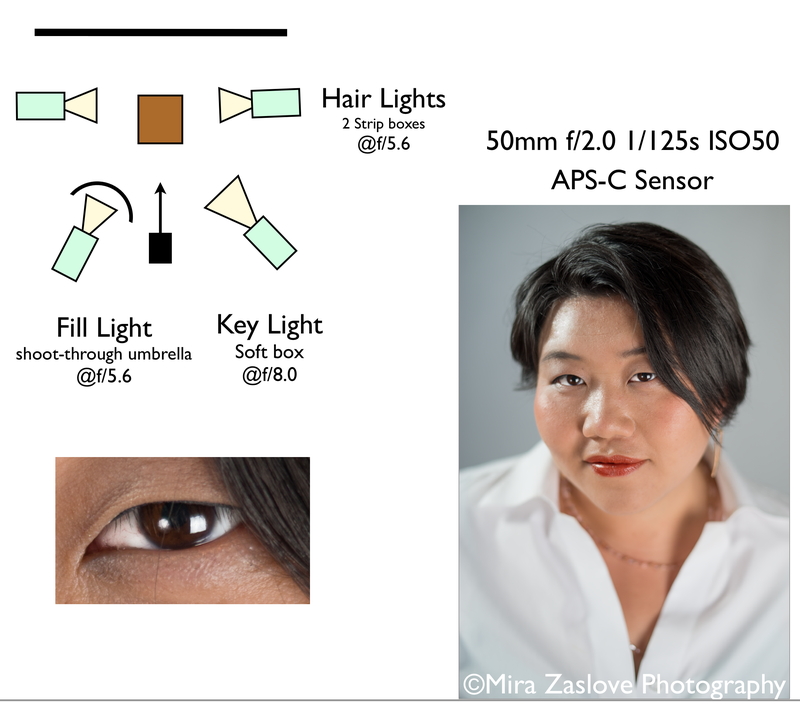 This photo was also taken at f/4.0 which is well within the range of apertures that this lens performs spectacularly in. I feel pretty comfortable with the lens in the f/2.8 to f/11.0 range and even at its widest open, f/1.8 the lens can produce beautifully sharp photos. With the Sony a99, you can sync with lights simply up to 1/250s, I shot this photo at 1/200s at ISO50. There’s quite a bit of separation between myself and the background, may be 12 feet (4 meters for my European readers), and at f/4.0 you get nice focus over my entire body but great bokeh in the background. I like the bright red rose just peaking around and I’m not sure where the splash of blue is coming from. This was a two light setup outside with a soft box and a speed light in a strip box. Like the previous hair light experiment, I kept the strip box close. The big difference here is that because I changed my stance so that I was dominantly facing the strip light. This effectively changes the strip light to the key light and makes the soft box the fill light/hair light. The hair light is doing a great job bringing out the high lights of my hair and the strip box is lighting my entire length evenly. 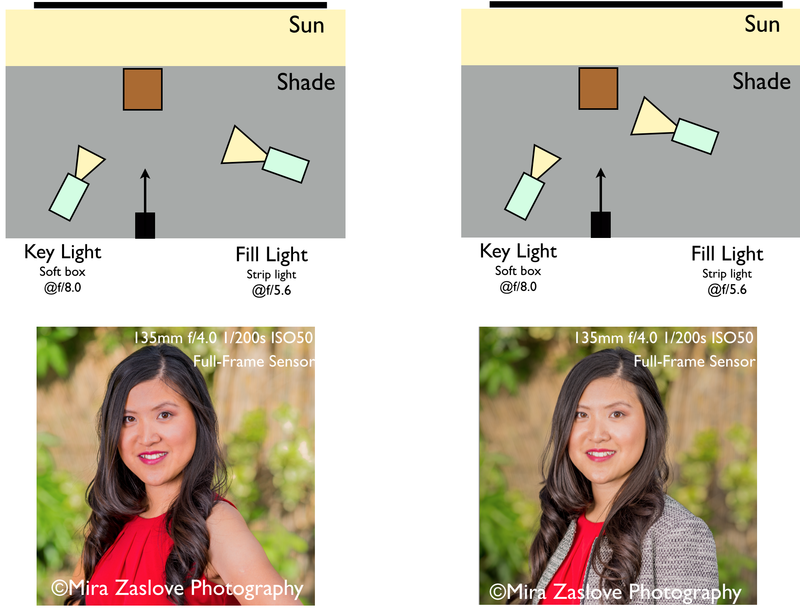 In the lighting diagram below, I’ve included a crop of the catchlights and connected them to the different lights. You can see that the strip light is very bright. Due to my stance, the soft box is just being caught in the side of eye. I included a similar shot that I liked of myself a bit more — just because I loved it, but the focus just missed. When you’re new to lighting, the concept of hair light seems so irrelevant, yet it can make a huge difference between having a a photograph filled with life and a photograph which seems static. 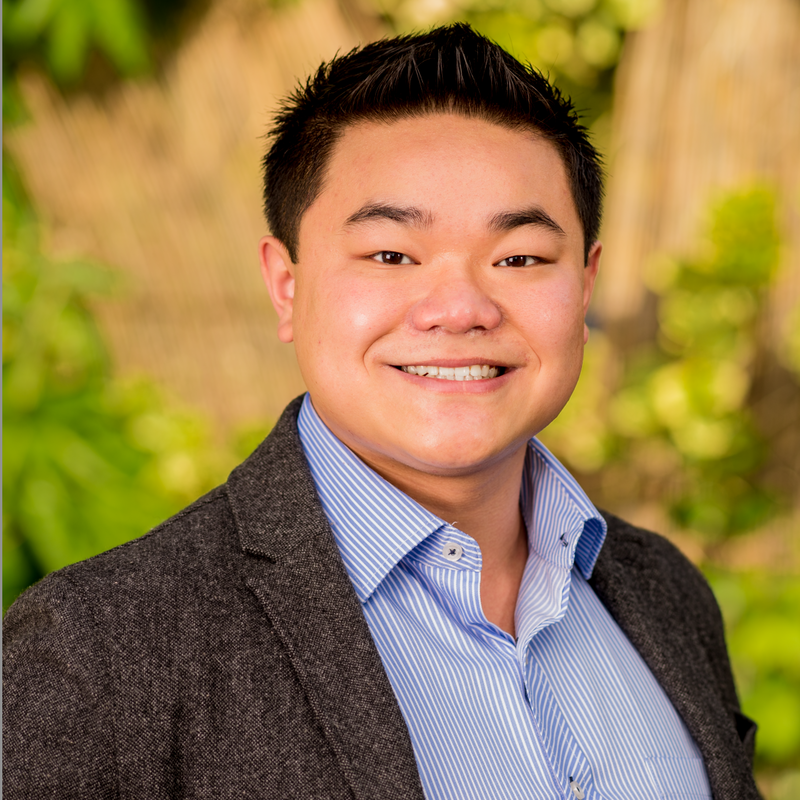 In the recent outdoor headshot shoot, I worked to get the hair light just right for this LinkedIn profile. We wanted to get a verdant outdoor experience which is common in many current high end social media profile photos. 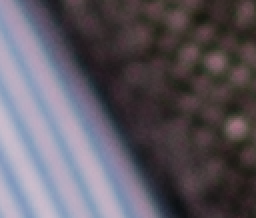 To do this you need a pretty narrow depth of field. I opened up the aperture to f/4.0 which allows a pretty crisp focus over the entire face, particularly taking a wider field of view that shows the shoulders. I used a 135mm lens on a full-frame camera which is a flattering length for portraits and exposes less of the background. I tried a near and a far hair/fill light coming in from the right. This changed how much light was caught by the hair and resulted in a subtle, but significant difference between the two photos. The subject was Asian has gorgeous hair and with the light shining on it, auburn highlights come out of it. While we went with the photo for the further hair light because we didn’t like the jacket, the near hair light really added an element of life to the photo. I recently did a photoshoot to get some new head shots. Ultimately, for social media websites, which are universally 1×1 crops. We’ve noticed recently that the crops of photos are wider than in the recent past, showing shoulders and more of the back ground. 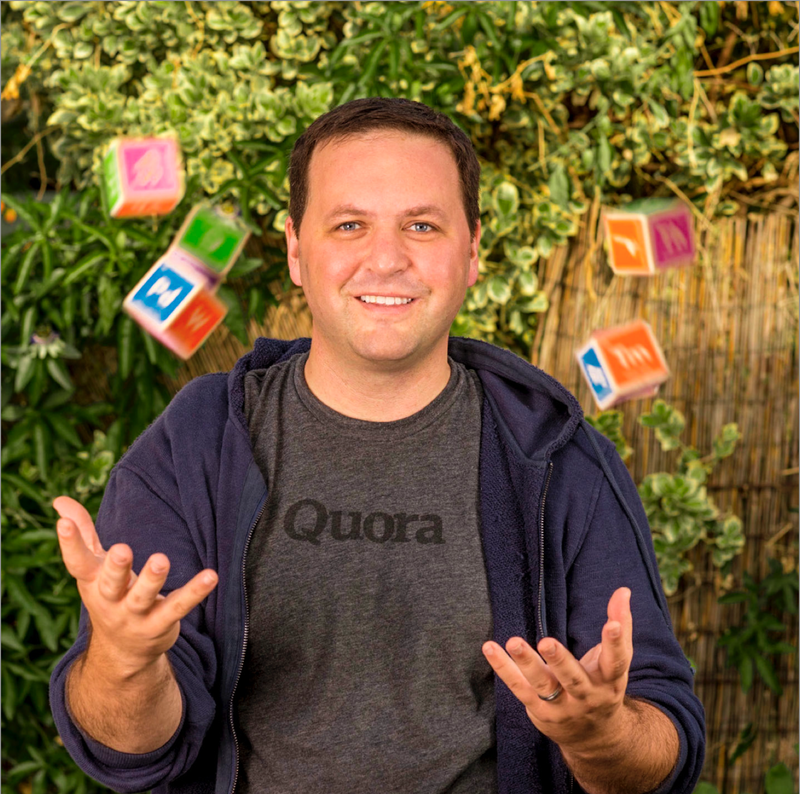 I started with my husband who wanted a new profile picture for Quora, his new job. He wanted something appropriately casual and quirky. He’s doing work as Quora’s “Ontology Architect,” organizing topics, which are building blocks of ideas. So we decided to have him throw blocks up in the air. After a dozen or so shots trying, we realized that he wasn’t going to be able keep his chin down and toss the blocks at the same time. Of course we could always photoshop them in, but that is really cheating. So instead, we decided to have Larry Liu throw up the blocks from underneath while I took the photo. 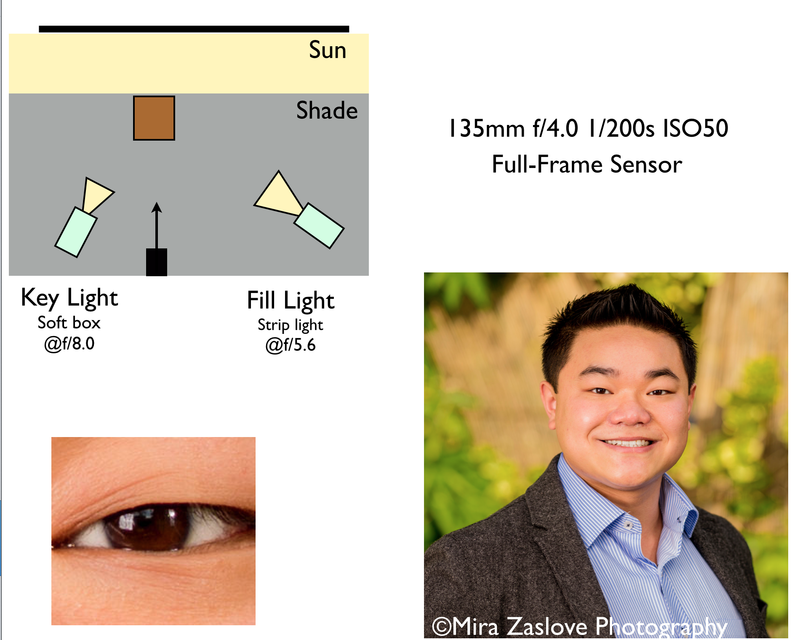 I usually like narrow depth of field for head shots, usually f/4.0 to f/5.6. 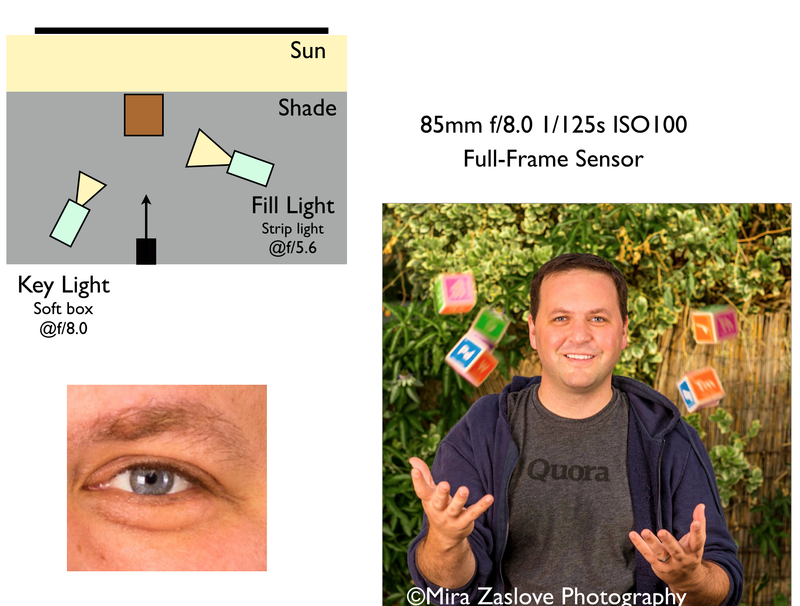 Sometimes we even like to go down to f/2.0. We also usually like a mid-telephoto lens with a focal length of 135mm to 200mm. But for this shot, we decided that we needed a wider field of view and we also wanted to have the blocks in reasonable focus, even if they were going to be blurred by motion, so we chose f/8.0. There are additional challenges to shooting outside with lighting. We usually simply connect one of the strobe lights and trigger the other view for the bounce light. Outside this doesn’t work because there isn’t enough bounce light to trigger. So we switched to pocket wizards (actually Yangnuo knockoffs). It was a simple two light setup with the background lit by late afternoon sun. Jay was in the shade so he could look at the camera without being blinded by the sun. 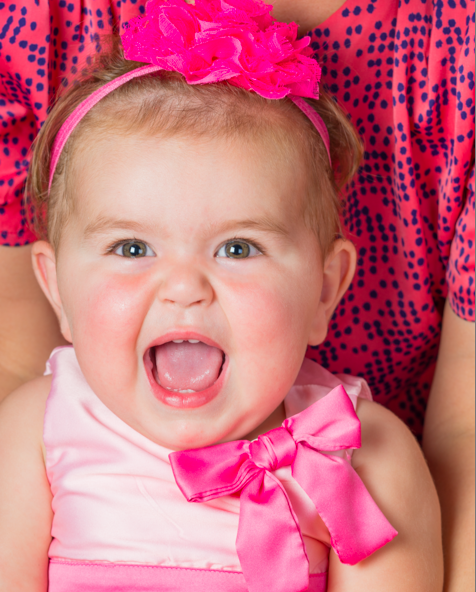 The key light was a soft box that was fairly straight-on and exposed to f/8.0. 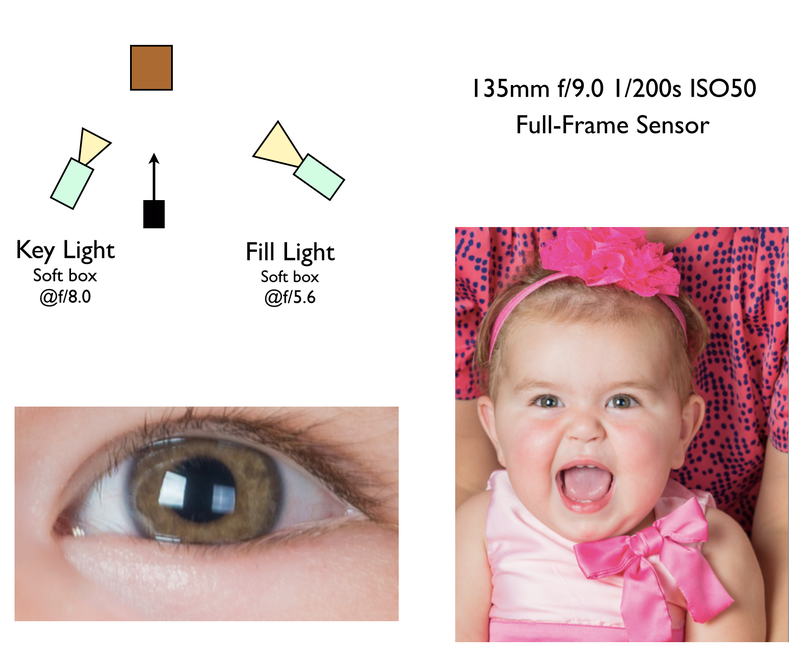 The fill-light was a speed light in a strip box exposed to f/5.6. The strip box was pretty close to the subject, giving a slightly more dramatic fill light. 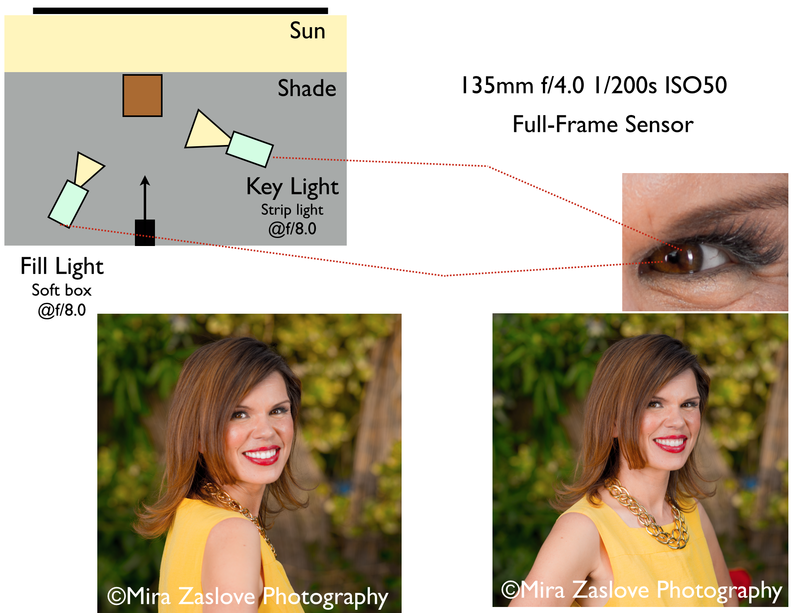 The diagram of the setup is below with the resulting shot. You can see the lighting in the catch-lights. I love narrow depth of field head shots. This one was recently taken of Lynn Tao, the CEO and founder of Juniper (http://www.getjuniper.com). She needed a head shot for some fund raising and we offered to take a couple of shots in our home studio before I gave birth (any day now). Narrow depth of field lets you focus in on the eyes and lets the other elements drift off. The lighting setup was pretty straight forward and shown below. I used a softbox a bit off-axis exposed at f/8.0 as the key light, then used a shoot-through umbrella exposed at f/5.6 as the fill light, and then two strip boxes shooting down as hair lights exposed at f/5.6. These are pretty strong hair lights, which gave a nice shine to her hair. One of the challenges with shooting with lighting is that you can’t shoot arbitrarily fast, typical sync-speeds with cameras are 1/160s to 1/250s. Thus to get a narrow depth of field you either have to turn down the lights very low, but that requires shutting out ambient light or you have to come up with a way to reduce the amount of light getting into the camera. I typically use variable neutral density (ND) filters to reduce the amount of light by some sizeable amount. The ND filter I used in this shot was 55mm filter that reduces light by a factor of 2 to 400, i.e. 1 stop to 8.6 stops. You can lose some sharpness with ND filters if they aren’t high quality. This one fortunately is a good one. Another interesting feature about narrow depth of field head shots is that there is a minimal aperture you should ever use. If you frame a portrait head shot, it will be about 60cm tall. You always want to have about 3.5cm in focus. 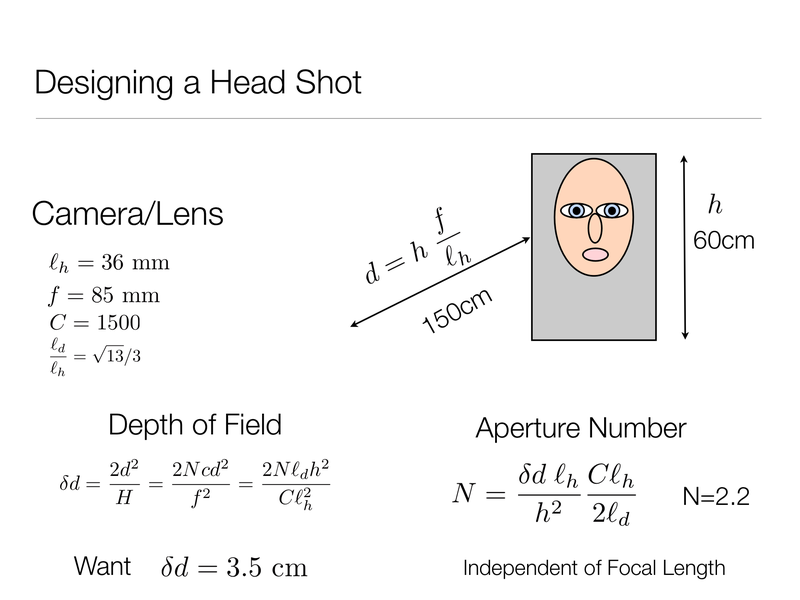 Now if you change focal length, keeping the aperture number fixed and keeping the framing of the shot, the hyperfocal distance will change, but the distance to the shot divided by the hyperfocal distance stays fixed. For a full frame camera, this works out to an aperture number of N=2.2, while for a APS-C crop sensor it works out to be N=1.6. I’ve attached a slide showing how the math works out. Sorry for the delayed post, I’ve been behind the Great Firewall and somewhat shockingly, WordPress is blocked. 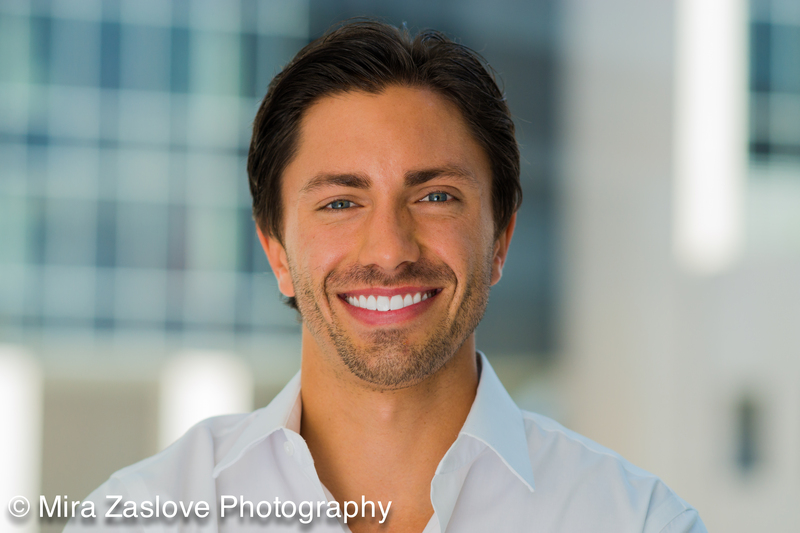 I recently got back and took a couple of quick headshots for young professionals. This one was a gorilla-style headshot in the Financial District in SF. He wanted something with a bit of a cityscape in the background. We shot for about 20 minutes and got about 100 shots off before we quietly disappeared. I used my 135mm f/1.8 lens that has become my go-to lens for most shoots. This shot was at 1/200s f/4.0 ISO400. It was a bright sunny day and he was under an awning looking towards the sun. The key light is reflecting off a neutral colored wall. The catch lights came from him looking out towards the sun. We had to work at making sure he wasn’t squinting.